Some rare mutations of factor IX result in elevated clotting activity, and can result in clotting diseases, such as deep vein thrombosis. 1 2 Biggs R, Douglas AS, Macfarlane RG, Dacie JV, Pitney WR (Dec 1952). "Christmas disease: a condition previously mistaken for haemophilia". British Medical Journal. 2 (4799): 1378–82. doi:10.1136/bmj.2.4799.1378. PMC 2022306 . PMID 12997790. 1 2 Di Scipio RG, Kurachi K, Davie EW (Jun 1978). "Activation of human factor IX (Christmas factor)". The Journal of Clinical Investigation. 61 (6): 1528–38. doi:10.1172/JCI109073. PMC 372679 . PMID 659613. ↑ Taran LD (Jul 1997). "Factor IX of the blood coagulation system: a review". Biochemistry. Biokhimii͡A. 62 (7): 685–93. PMID 9331959. ↑ Boland EJ, Liu YC, Walter CA, Herbert DC, Weaker FJ, Odom MW, Jagadeeswaran P (Sep 1995). "Age-specific regulation of clotting factor IX gene expression in normal and transgenic mice". Blood. 86 (6): 2198–205. PMID 7662969. 1 2 Zhong D, Bajaj MS, Schmidt AE, Bajaj SP (Feb 2002). "The N-terminal epidermal growth factor-like domain in factor IX and factor X represents an important recognition motif for binding to tissue factor". The Journal of Biological Chemistry. 277 (5): 3622–31. doi:10.1074/jbc.M111202200. PMID 11723140. ↑ Wilkinson FH, Ahmad SS, Walsh PN (Feb 2002). "The factor IXa second epidermal growth factor (EGF2) domain mediates platelet binding and assembly of the factor X activating complex". The Journal of Biological Chemistry. 277 (8): 5734–41. doi:10.1074/jbc.M107753200. PMID 11714704. ↑ Brandstetter H, Bauer M, Huber R, Lollar P, Bode W (Oct 1995). "X-ray structure of clotting factor IXa: active site and module structure related to Xase activity and hemophilia B". Proceedings of the National Academy of Sciences of the United States of America. 92 (21): 9796–800. doi:10.1073/pnas.92.21.9796. PMC 40889 . PMID 7568220. ↑ Freedman SJ, Furie BC, Furie B, Baleja JD (Sep 1995). "Structure of the calcium ion-bound gamma-carboxyglutamic acid-rich domain of factor IX". Biochemistry. 34 (38): 12126–37. doi:10.1021/bi00038a005. PMID 7547952. ↑ Zögg T, Brandstetter H (Dec 2009). "Structural basis of the cofactor- and substrate-assisted activation of human coagulation factor IXa". Structure. 17 (12): 1669–78. doi:10.1016/j.str.2009.10.011. PMID 20004170. ↑ Kurachi K, Davie EW (Nov 1982). "Isolation and characterization of a cDNA coding for human factor IX". Proceedings of the National Academy of Sciences of the United States of America. 79 (21): 6461–4. doi:10.1073/pnas.79.21.6461. PMC 347146 . PMID 6959130. ↑ Nicholl D. (2002). An Introduction to Genetic Engineering Second Edition. Cambridge University Press. p. 257. ↑ Taylor SA, Duffin J, Cameron C, Teitel J, Garvey B, Lillicrap DP (Jan 1992). "Characterization of the original Christmas disease mutation (cysteine 206----serine): from clinical recognition to molecular pathogenesis". 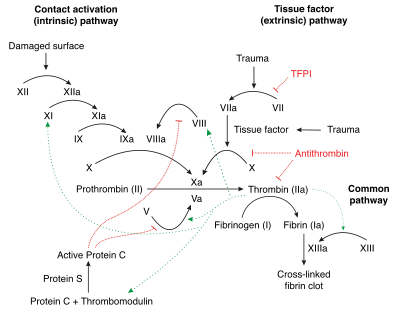 Thrombosis and Haemostasis. 67 (1): 63–5. PMID 1615485. ↑ "Home: BeneFIX Coagulation Factor IX (Recombinant) Official Site". ↑ "Home: Alprolix [Coagulation Factor IX (Recombinant), Fc Fusion Protein] Official Site". ↑ Simioni P, Tormene D, Tognin G, Gavasso S, Bulato C, Iacobelli NP, Finn JD, Spiezia L, Radu C, Arruda VR (Oct 2009). "X-linked thrombophilia with a mutant factor IX (factor IX Padua)". The New England Journal of Medicine. 361 (17): 1671–5. doi:10.1056/NEJMoa0904377. PMID 19846852. ↑ Rossi M, Jayaram R, Sayeed R (Sep 2011). "Do patients with haemophilia undergoing cardiac surgery have good surgical outcomes?". Interactive Cardiovascular and Thoracic Surgery. 13 (3): 320–31. doi:10.1510/icvts.2011.272401. PMID 21712351. ↑ "Home: Factor IX Mutation Database". Davie EW, Fujikawa K (1975). "Basic mechanisms in blood coagulation". Annual Review of Biochemistry. 44: 799–829. doi:10.1146/annurev.bi.44.070175.004055. PMID 237463. Sommer SS (Jul 1992). "Assessing the underlying pattern of human germline mutations: lessons from the factor IX gene". FASEB Journal. 6 (10): 2767–74. PMID 1634040. Lenting PJ, van Mourik JA, Mertens K (Dec 1998). "The life cycle of coagulation factor VIII in view of its structure and function". Blood. 92 (11): 3983–96. PMID 9834200. Lowe GD (Dec 2001). "Factor IX and thrombosis". British Journal of Haematology. 115 (3): 507–13. doi:10.1046/j.1365-2141.2001.03186.x. PMID 11736930. O'Connell NM (Jun 2003). "Factor XI deficiency--from molecular genetics to clinical management". Blood Coagulation & Fibrinolysis. 14 Suppl 1: S59–64. doi:10.1097/00001721-200306001-00014. PMID 14567539. Du X (May 2007). "Signaling and regulation of the platelet glycoprotein Ib-IX-V complex". Current Opinion in Hematology. 14 (3): 262–9. doi:10.1097/MOH.0b013e3280dce51a. PMID 17414217.